This simple Southwestern Shrimp and Black Bean Salad is an easy, healthy and delicious winner in my book. It’s perfect for a light one-dish lunch or supper. It’s from one of my most-used Weight Watchers cookbooks, Weight Watchers Comfort Classics : 150 Favorite Home-Style Dishes. Everything I’ve made from it has been a hit, including this easy Shrimp and Black Bean Salad that comes together with flavors of the Southwest. Published back in 2009, it gives the old point values. But every recipe includes nutritional details so it’s easy enough to recalculate to PointsPlus with a Weight Watchers calculator, or WW SmartPoints by using Weight Watchers Recipe Builder. Rod, Mom and I all liked this one so I’m adding it to my “make again” file. In fact Mom rated it an A+, not a grade she gives often! This shrimp and black bean salad works with the Simply Filling technique too. According to my calculations, each generous 1-1/3 cups serving has about 234 calories, *5 Weight Watchers PointsPlus, *6 SmartPoints, *2 WW Freestyle SmartPoints. Enjoy! 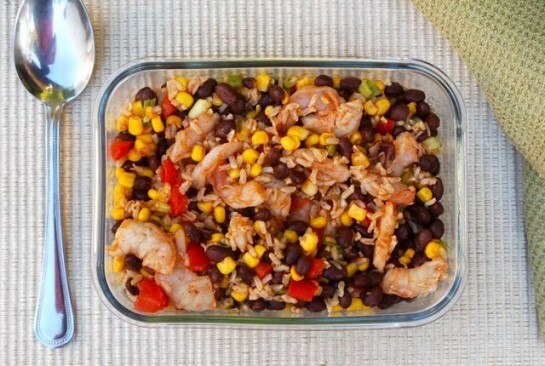 If you refrigerate this shrimp black bean salad, let it stand on the counter about 15 minutes before serving. If you’ve made this Shrimp and Black Bean Salad, please give the recipe a star rating below and leave a comment letting me know how you liked it. 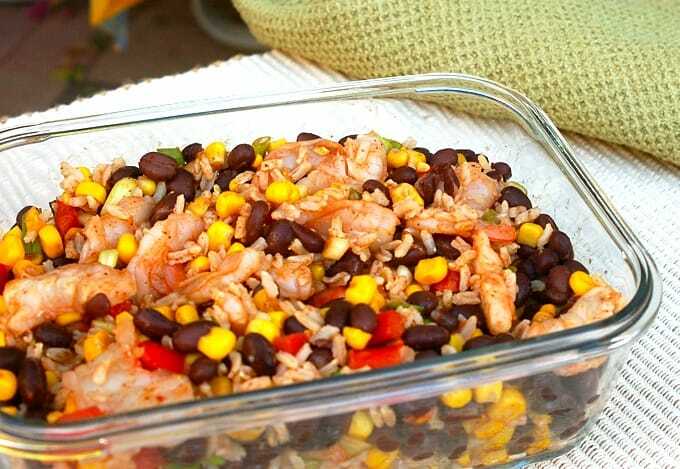 A simple, yet zesty, Southwest shrimp black bean salad perfect for a light and healthy lunch or dinner. In a large bowl whisk together the vinegar, lime juice (if using), oil, chili powder and salt. 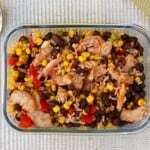 Add the rice, corn, black beans, shrimp, tomato, scallions and cilantro, if using. Stir gently to combine. Taste and adjust seasoning, adding more vinegar, lime juice, chili powder and/or salt to suit your tastes. Serve at once or cover and refrigerate up to 2 days.